University students in the U.S. interested in bringing natural stormwater runoff management to their campuses are invited to participate in the 6th-annual U.S. Environmental Protection Agency (EPA) Campus RainWorks Challenge. Contest registration will be open from Sept. 1 to Sept. 30; full application materials must be submitted by Dec. 15. As in past years, EPA seeks designs for innovative green infrastructure projects at either the planning or proof-of-concept stages. 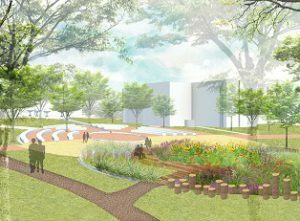 Participating students who submit designs in teams advised by faculty sponsors must work with their institution’s facilities team to plan a viable green infrastructure installation on-campus that contributes positively to the local environment, economy, and community. Submissions will be judged by a panel of green infrastructure experts from EPA, the American Society of Landscape Architects (Washington, D.C.), the American Society of Civil Engineers (Reston, Va.), and the Water Environment Federation (Alexandria, Va.), as well as academic experts from non-competing universities. First-place teams in the Master Plan and Demonstration Project categories each will receive $2000 to be split evenly among student participants. Runner-up teams in both categories receive $1000. One project narrative. A 12-page-maximum statement that details the team’s design process and how each facet of the design provides community benefits, improves campus resiliency, and if implemented, will perform as intended. One design board. This board shows a visual representation of the green infrastructure installation and the proposed area it will occupy. In past competitions, participants were required to submit two design boards instead of one. One video pitch. A 3-minute-or-less introduction video to the design team, its concept, and home institution. This is a new requirement for this year’s competition. One letter of support from university facilities staff. This short, signed note on university letterhead indicates that the student design team collaborated with campus officials. In the Demonstration Project category during last year’s 2016 Campus RainWorks Challenge, a team from Kansas State University (Manhattan, Kan.) took home the first prize for a proposal to build rainwater harvesting mechanisms and permeable pavement on one of the campus’ historic green spaces. U.S. Environmental Protection Agency/Kansas State University. All materials should be emailed to RainWorks@epa.gov by 11:59 p.m. on Dec. 15, 2017. The competition is open to both undergraduate and graduate students attending any college, university, technical school, or other higher education institution located in the U.S. or its territories. Students may decide amongst themselves how large their teams should be, but EPA encourages teams comprised of students from diverse fields of study. For more details, download a PDF file of EPA’s rules and procedures for the 2017 Campus RainWorks Challenge. Register for the contest at EPA’s website to indicate your intent to submit a design.